Terabyte Indexer. dtSearch Desktop and Network can index over a terabyte of text in a single index, spanning multiple directories, emails and attachments, online data and other databases. The products can create and search any number of indexes. Indexed search time is typically less than a second, even across terabytes of data. Enterprise Searching. The dtSearch product line offers efficient multihreaded searching, with no limit on the number of concurrent search threads. Even with many simultaneous dtSearch Network searches across a very large indexed database, concurrent search time is typically under a second. Federated Searching and the dtSearch Spider. 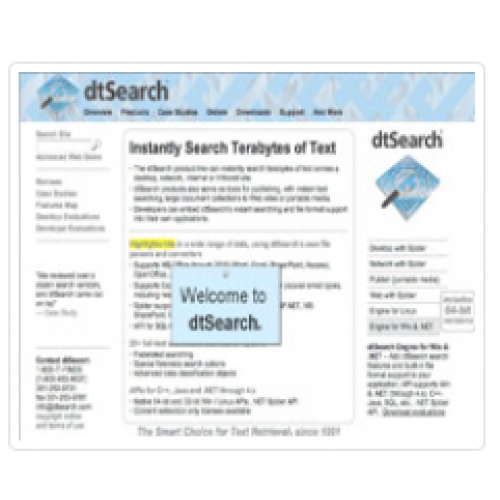 dtSearch Desktop and Network products provide federated searching across any number of directories, emails (with nested attachments), and databases. The dtSearch Spider adds local and remote, static and dynamic online content to a search. The Spider can index sites to any level of depth, with support for public and private or secure online content, including log-ins and forms-based authentication. dtSearch products support integrated relevancy ranking with highlighted hits across both online and offline data repositories. 25+ Search Options and International Language Support. dtSearch products offer over 25 search types, including special forensics search options. For international language coverage, dtSearch products support Unicode, including support for right-to-left languages, and Chinese/Japanese/Korean character options.